On Saturday night, the San Antonio Spurs will face off against the Denver Nuggets in the Mile-High City in game one of the 1st round of the playoffs. The Spurs are the 7 seed and are 48-34 on the season. 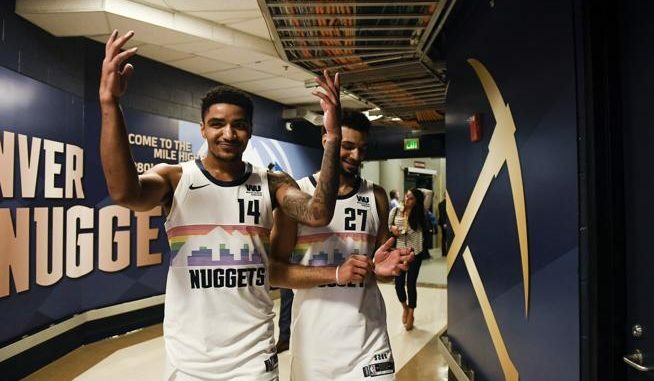 The Nuggets are the 2 seed and went 54-28 this season. The Spurs are coming off a 105-94 win over the Mavericks their last time out. LaMarcus Aldridge was incredible in this one, scoring 34 points on 15 of 21 shooting to go with a team-high 16 rebounds. Demar DeRozan scored 19 points on 7 of 15 shooting to go with 5 rebounds and 4 assists. Derrick White tallied 14 points on 6 of 8 shooting to go with 6 rebounds and 3 assists. Bryn Forbes was the final Spur in double figures with 10, and Patty Mills led the team in assists with 5. The Nuggets are coming off a 99-95 win over the Timberwolves in their regular season finale. Nikola Jokic led the way in this one, scoring 29 points on 13 of 26 shooting to go with a team-high 14 rebounds. Jamal Murray scored 27 points on 6 of 12 shooting to go with 8 rebounds and a team-high 7 assists. Gary Harris tallied 14 points on 5 of 11 shooting, and Will Barton scored 20 points on 4 of 10 shooting to go with 9 rebounds and 4 assists. The Spurs are led by LaMarcus Aldridge, who is averaging 21.3 points a game and is the leading rebounder with 9.2 per game. He is mirrored by Demar DeRozan, who averages 21.2 points a game to go with 6 rebounds and a team-high 6.2 assists a game. Rudy Gay is scoring 13.7 points a game to go with 6.8 rebounds. Bryn Forbes tallies 11.8 per game, and Marco Bellinelli chips in 10.5 a game. Derrick White and Patty Mills each score 9.9 per game. The Spurs are putting up 111.7 points per game and are shooting 47.8% from the field. The Nuggets are led by big man Nikola Jokic, who is leading the team in all 3 major categories. He is averaging 20.1 points per game to go with 10.8 rebounds and 7.3 assists. He is followed by Jamal Murray, who averages 18.2 points a game and 4.2 rebounds and 4.8 assists. Gary Harris pours in 12.9 a game, and Paul Millsap chips in 12.6 points and 7.2 rebounds. Will Barton is scoring 11.3, and Malik Beasley tallies 11.3 a game. Monte Morris is the last double-digit scores with 10.4 a game. The Nuggets are scoring 110.7 points a game and are shooting 46.6% from the field. The Nuggets come in at -5.5. The Nuggets are a very young team that are having success for the 1st time while the Spurs are full of veterans who have been here before. The home crowd will be going crazy in this one, and I think that is going to play a big factor. Jokic is a better player than Aldridge and will win that battle all night. The Nuggets will slow down Aldridge, and that will lead to a double-digit victory. Take the Nuggets -5.5.